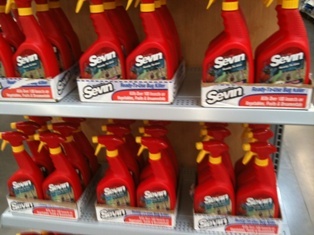 Sevin is one of the most toxic pesticides still available to homeowners. As it states on the label, it is very deadly to honeybees, one of our most important beneficial insects. Take a look at all the additional information on the web. Some folks use it for grasshoppers - it doesn't work, of course. Instead spray your plants with kaolin clay at 2 cups per gallon of water and add 1 oz of orange oil and 1 tablespoon of liquid soap. The commercial product is Surround WP.